The first cricket match I watched was also the first international match to be played in Dhaka after our independence. MCC's tour of 1976-77 marked the entrance of newly born Bangladesh in international cricket arena. The highlight of the tour was the three-day 'unofficial' test match at Dhaka. It was basically exhibition staff; but even in the third afternoon there were plenty of actions. Khaled Rumy and Raqibul entertained the crowd with some delightful square drives and cuts; the crowd for their part cheered every stroke (possibly they were not sure when would they get the chance to see international cricket again); the MCC players were enjoying the lovely weather more than anything else. As for myself, a seven-year old, I was more interested in the oranges and the ice creams. As the shadows lengthened on a cool January evening, we witnessed the match head towards an inevitable draw. Little did we know that we were actually watching a beginning, beginning of a story which would see Bangladesh play at the highest level of the game within quarter of a century. In the minds of many, Bangladesh's truimph in the 1997 ICC trophy can be termed as the turning point in our cricket history. This may be true, but to me the most important developments took place in the eighties. It was in the eighties that cricket was accepted as an important aspect of our life. Specially, the young people took this game to their heart. Domestic cricket became organised, school cricket was introduced, our national team took small steps towards glory at international level. That is why the eighties deserve a special look. However, it won't be very wise to chronicle all the events of this decade, it will be boring and at the same time, unneccessary. Instead, at first, I would like to focus on the three important achievements of this era, the captaincy of Ashraf Lipu, development of school cricket and finally the introduction of professionalism in our cricket towards the end of the decade. 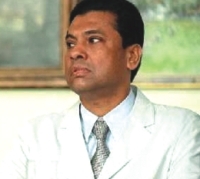 Gazi Ashraf Lipu: Pataudi of Bangladesh? 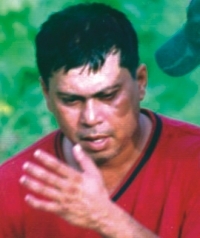 Gazi Ashraf Hossain, better known by his nickname Lipu, first played for Bangladesh in 1981. Excellent perfomance in the 82 ICC trophy in England plus some consistent scores in domestic cricket for Abahani meant that he soon became a regular for the national team. Bangladesh national team was going through a transition period in the mid eighties; Raqibul was still there, but seasoned veterans like Syed Ashraful, Khaled Rumi, Yousuf Babu, Hira all had bade farewell to international cricket. At this critical moment, with the future in their minds, the selectors entrusted the captaincy to young Lipu. This turned out to be a great decision. In terms of results, Lipu's success is moderate. In fact, our performance in the 86 ICC trophy (under his captaincy) has to go down as one of the worst in our cricket history. Yet, it was under his captaincy that the national team took shape. 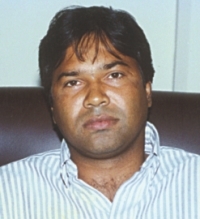 Batting at number three he was a regular contributor with the bat (although his form faded a bit after 1988), Players like Nannu, Atahar, Nawsher Pricne all developed during this period, while new faces like Akram Khan and Aminul Islam Bulbul came into the forefront in the late eighties. It is interesting to compare Lipu's captaincy record with that of the Indian legend Mansur Ali Khan Pataudi (Father of current Bollywood star Saif Ali Khan.) Pataudi got the Indian captaincy in slightly bizarre circumstances. During the 62 tour of West Indies, the regular captain, Nari Contractor was severely injured (After being hit in his hit by the giant fast bowler Charlie Griffith, during a tour game against Barbados). In fact, at one stage his life seemed threatened. At that stage Pataudi, the Vice-Captain had to take over. He was only 21 then. He captained India throughout the sixties. His record was pretty poor, especially in 1966-67 when they lost 9 of the 10 test matches played. But, here again the future Indian team was built under his guidance. The similarity with Lipu's captaincy era is noticeable. Coming back to Bangladesh cricket, another important thing was the development of school level cricket. 'Nirman Cricket' as it was often called after the name of the sponsors, became very popular among the young people immediately after its start in the early eighties. Obviously these games did not get the same amount of media coverage like top league games. But from behind the scene, young talents were nurtured and developed. Not surprisingly before the end of the decade we had a formidable under-19 side. During a tour of England, in the summer of 1989, the young tigers won all their matches against strong oppositions. Future stars, Javed Omar, Habibul Bashar, Khaled Mahmud all were part of that team. Towards the end of this decade, the era of professionalism started in our cricket. For this, we are indebted to the foreign cricketers, specially the Sri-Lankan ones to a great extent. At the beginning of the decade, cricket was considered to be more of a pastime rather than a profession, even by our top players. Most of them were involved with other professions. Some were even involved in other sports. Badshah used to play football for Abahani, while soccer stars like Salahuddin and Shanto played league cricket in Dhaka. 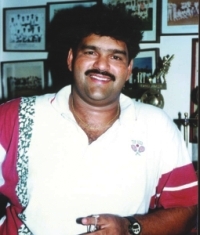 The season 88-89 saw a number of top Lankan cricketers truning up for different teams. Not only did they improve the quality of Cricket, but more importantly they changed our attitude towards the royal game. Samara Shekhara, Kaluwitharana, Labroy, Asoka De Silva and others helped our cricketers develop a serious attitude towards the game. Most of them were here for a short time, for the money no doubt, but their influence over our cricket is longlasting. It may be worthwhile now to look at some of the outstanding individual achievements of the decade. Some of them might seem rather trifling now, but at that time their values were immense. 1) Right arm medium Pacer Obaidul Haque Azam takes 7/18 against MCC in an innings at Faridpur in Jan, 81. 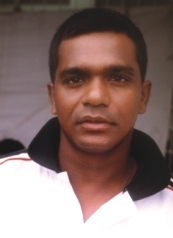 2) Opener Yusuf Babu scores 115 against Papua New Guinea in the 3rd place-deciding match of the ICC trophy, 1982. 3) Tariquzzaman Munir scores a triple hundred (308) for Dhaka University against Dhaka District in the Semi-Final of the national cricket championship (1984-85). Along with Atahar Ali Khan (155) he puts on 447. 4) Jan 86, Hard-hitting batsman Rafiqul Alam smashes a dazzling 81 against a Pakistani side, led by Imran Khan. 5) March 86, Shahidur Rahman top scores with 37 against Pakistan, in our very first ODI. Medium pacer Badshah takes 2 for 23 from 9 overs in the 45 over match. 6) December 1989, Both Selim Shahed and Aminul Islam Bulbul scores a century each against Malaysia in the Asian Under-19 competition. They put on 163 for the 3rd wicket. Javed Omar scores 55 against Pakistan in the same tournament. The golden Boys: Team of the eighties. I have formed here a group of 11 players who I think would have formed the strongest Bangladesh team in the 80s. I had to leave out 2 of my favourites, Omar Khaled Rumi and Syed Ashraful Haque, as they played their best cricket in the 70's, not in the 80's. Also, Atahar Ali Khan is included as a middle-order bat, because he used to bat in that position in those days. He became an opener late in his career. It is worthwhile to take a look at Bangladesh's last international match at Dhaka during this decade. On 12th December, 1989, the Bangladesh U-19 side met their Pakistani counterparts at Dhaka. After winning the toss Bangladesh Captain Khaled Mahmud Sujon put the opposition in, and his decision looked to be a correct one as his swing bowlers Anis and Saiful used the heavy conditions well to restrict mighty Pakistan to 3 for 43. Spinner Selim Shahed then inflicted further damage and Pakistan were struggling at 91 for 7. Then, however, entered wicket keeper Moin Khan. Applying his very own unorthodox method of batting, he smashed the bowling all over the park. His 74 of 73 balls turned the game on his head. With help from the tail-enders he took the Pakistani score to 187/9 from 47 overs. Not surprisingly, Moin got the gloves of the Pakistan national side within a year. Still it was a modest target, but star batsmen Jahangir, Selim Shahed and Bulbul all fell cheaply. Opener Javed Omar (55) and MR Selim (28) (now an umpire) repaired the damage. They put on 58 for the 4th wicket, but in doing so they took much time. Javed Omar's run out proved to be fatal. After that, Habibul Bashar Sumon (17) played well. But when he and skipper Sujon, both were run out, our hopes faded. At the end we fell short by 32 runs. The reason that I chose to discuss this U-19 game in such details is that in many ways this game describes the story of our cricket in the 80's. There were plenty of hopes, but in the end there were more failures than successes. Yet, these failures proved to be the backbones of our future successes. Some of the players, who missed their chance of glory on that December afternoon were to achiveve international glory later on. Khalded Mahmud was a hero of our WC win over Pakistan, 10 years later. 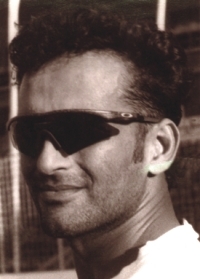 Bulbul smashed a century on his test debut, Habibul Bashar is now widely regarded as a top middle order batsman in the world. The glories came later, but it was really in the 80's that cricket in Bangladesh started it's journey.